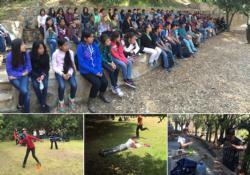 Outdoor Education is an essential part of the New LA Experience. It's an opportunity for kids to unplug and experience the outdoors. While the students will have the time of their lives, there is also serious science learning that takes place. The outdoor education program is designed for students to acquire valuable skills and perspective that will help in their preparation for academic achievement and the world beyond. Description: Students stay in dorm style cabins in beautiful Temescal Canyon right here in the Santa Monica Mountains. They spend three days and two nights exploring the local chaparral ecology, geology and Native American history in the area. Students also participate in team building activities and science games. Description: Students stay in “tent-cabins” (large canvas tents on platforms with bunk beds inside) at White’s Landing on Catalina Island. They spend three days and two nights learning about island ecology and geology, marine biology and participating in activities such as snorkeling, kayaking, hiking and team building. Description: Students stay in tents in the incomparable Joshua Tree National Park. Joshua Tree offers engaging activities for students, such as exploring area trails, studying the various habitats within the park, rock climbing, and group initiatives. Joshua Tree National Park is a uniquely beautiful location, bound to provide the backdrop for our most memorable trip yet.